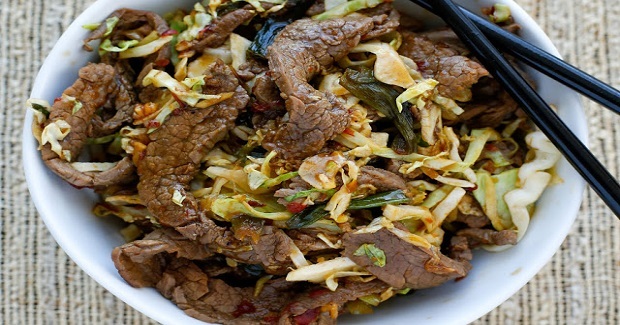 Mongolian Beef With Noodles Recipe - Gutom Na! Posted on Monday, March 6th, 2017 at 12:54 pm. Cook, drain, and rinse the noodles if you’re including them. Stir together the soy sauce, sugar, water, chili paste, and pepper flakes. Set the sauce mixture next to the stove. Add 1/2 tablespoon oil to the hot skillet over medium high, then add the ginger, garlic, and green onions. Saute for about 1 minute, until fragrant. Add the sauce and bring to a boil. Simmer for about 2 minutes, until just barely reduced. (This is not a “thick” sauce.) Add the cabbage, toss to coat and slightly wilt, about 30 seconds. Add the beef back to the skillet and toss to coat everything. If you’re including noodles, add them now and toss once more. Enjoy!